I believe the announcement for the 430 and 410 is imminent, the few dealers left are meeting with Lotus USA today and tomorrow. They should be presented with the future plans going forward and logically some Volvo dealers and service centres could be added to make up for the lost dealerships and bolstering the support infrastructure for Lotus in North America. It seems that while they were not supposed to get the GT410 initially they/we are going to get it. Production of Evora 400 ceased? I don't think dealers even know at this point. All we know is that there will/should be a formal presentation of the 430 at some point in December and deliveries are/would be set to start in the spring. The question is what will replace the 400? A downgraded GT 410 with the 400 tailgate seems like something easy enough to do. But do they want to replace it? I guess once again we'll have to wait until Geneva to get an answer. Considering they need a car to sale at least in North America and China just got its first allocation it would make sense to have an entry level model in the range. Lotus Group shareholders are involved so I hope they'll get Lotus Cars involved too. The logical move would be to have Dany Bahar form a special team to lead the assault and get some mechanics, tech and engineers to transfer to the RTN factory! Or even Better Group Lotus should by the RTN factory! And the shakedown would take place at Hethel on the company track before a presentation in KL in front of Proton, petronas and the dignitaries of the Malaysian gov! Looks stunning!Love the forged alloys! What will be the first long trip?! Enjoy it! Oh please no! No gullwing doors! I really like that front nose and would like nothing better than to see Lotus Cars go with this one on the S or SC variant of the car! It's an evora nobody wants to get decals or other stupid things on it! But the front nose and the rear side vents will make sense on the oommphed up model. Of course I want paddleshifters and more than anything else I want a superlight alcantara microfiber interior to get closer to these announced 2600 lbs or 1180 kg!!!! Which means bye bye to the back seats. This 124 doesn't have a blower and already delivers 394 bhp. I'd be curious to see which category Lotus Sport will choose to compete in, I hope GT3! Wow!!! Can't wait to see that on the track! I may go to the Nurb just to see it lap! Will this front nose make its way to the road car cause I like it more than what the road car has now! Bahar to join Lotus top management! Tuesday, September 1st 2009, 10:04 GMT Bahar leaves Ferrari, moves to Lotus By Jonathan Noble	Dany Bahar, the man in charge of Ferrari's Global Brand Department, has left the team and is taking up a senior position within Lotus. He originally joined the team in May 2007, having previously shot to prominence as the right hand man to Red Bull boss Dietrich Mateschitz. Bahar had little involvement with Ferrari's F1 team and his main role was to develop the Ferrari brand worldwide. AUTOSPORT understands that he is to become the CEO of Lotus. source: autosport.com So the man in charge of Ferrari brand perception would become the next Lotus CEO. Bahar is a marketing/pr guru not an engineer nor a finance geek. Would it mean that the shareholders are going to be pushing from a wider 'fan' base? Yes obviously! Would it mean that the company will go back to motor racing? MJK I hope you'll recover fully and have long years to enjoy your latest creation! That's a blow Lotus was finally doing better nd now that. Let's hope the new leadership will keep it on target! I do believe MJK should get a honorary role at the the company and should be kept on the board even if just as in a consultant role! Evora production limit to be hit! That's very good news indeed! Well done Lotus I hope it'll be enough for shareholders to vote the money for the New Esprit! Reminder for Santa that I need to send before Christmas 2014. Low mileage black Lotus Evora! I knew this car was going to look great in black but that is beyond good looks it's just hot! I have to say that I'm seriously impressed. I did not imagine that it was possible to stick a stroller in that tiny trunk! 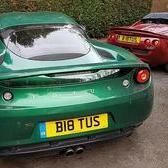 Although considering that the Elise is a strict two seater it does mean that mum or dad will be left home alone as one parent will go with baby for the drive. The Elise, The ideal car for single parents! Or more realistically bad uncles! I think some are trying to come up with problems which do not exist!